Renewal by Andersen puts much time and effort into ensuring the lasting energy efficiency of the windows they produce. Each Andersen window is EnergyStar rated. Each one utilizes materials that have been specifically designed for increased energy efficiency, including Renewal’s exclusive Fibrex material and Low-E glass packages. You won’t find a window company with a better underst anding of our deeper dedication to energy efficient windows. The need to save money on monthly energy bills is something to which every homeowner can relate. It seems that every year the prices of gas, oil, and electricity get higher and higher and keeping a home bright and comfortable gets more and more expensive. Renewal by Andersen seeks to counteract those skyrocketing prices with advanced windows that take into account the factors that lead to energy loss or overuse. Unlike wood or vinyl windows, which will crack or leak over time, Renewal by Andersen’s Fibrex windows remain intact through even the harshest weather. That means that your costly heating or cooling energy remains trapped within your home, allowing your temperature regulating systems to work at peak efficiency. Like their Fibrex frames, the Low-E glass used in each Renewal by Andersen window helps to limit the work load of your heating and cooling systems. They do so by limiting the penetration of infrared sun rays, which cause temperature fluctuations in your home if allowed to enter through your windows. Those fluctuations cause your heating and cooling systems to constantly kick on and off, which uses up quite a bit of energy. With Low-E glass, IR rays are kept at bay and your heating and cooling systems will work only as directed. 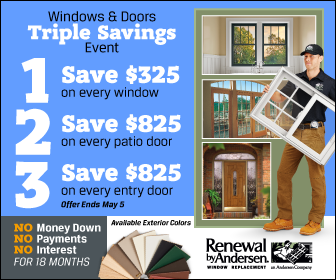 For more information on the energy efficiency properties of Renewal by Andersen windows, make a call to your leading source for energy efficient replacement windows in St. Louis- Renewal by Andersen of St. Louis.